Olusegun Obasanjo has once again attacks the Buhari led administration. In a statement released by his media aide, Kehinde Akinyemi , the former president said some supporters of the Buhari-led administration are peddling rumors that he is now in support of his re-election bid. This is not true as the poor performance of this administration can be seen by all and sundry. He says he cannot endorse failure. On President Buhari's trip to the US, the former president said US president Donald Trump in a condescending manner, ordered President Buhari to go back home and stop the killings going on in Nigeria. It was reviewed that the former president, Olusegun Obasanjo met with some Nigeria Labour Congress leaders in his house in Abuja on Workers’ Day. What a pathetic fallacy! Chief Obasanjo never met any Labour man or woman on May 1, 2018 to make any supposed volte face to support Buhari. It has come to the attention of Chief Olusegun Obasanjo that some elements in the Muhammadu Buhari camp and or support group are desperate to secure a second term, fair or foul. In this desperation, everything is fair, including telling libelous lies against persons and institutions, instead of addressing the fundamental issues of statecraft and economic management. In the last 24 hours the internet has been bombarded with deliberate falsehoods aimed at hoodwinking the unsuspecting Nigerians to believe that Obasanjo has now supported Buhari for his second term because of some perceived Buhari’s ‘superlative’ performance in his encounter with Trump during his visit to the White House in Washington DC. In another breath, these blackmailers insinuated that Chief Obasanjo met with some Nigeria Labour Congress leaders in his house in Abuja on Workers’ Day. What a pathetic fallacy! Chief Obasanjo never met any Labour man or woman on May 1, 2018 to make any supposed volte face to support Buhari. Furthermore, neither was Chief Obasanjo in Abuja on that date nor does he own a house in Abuja. Any time he visits Abuja, he usually stays in a Guest House or hotel. For the record, Obasanjo has not and cannot endorse failure. His position remains as stated in his January 23rd, 2018 statement on the state of the nation. Chief Obasanjo sympathises with the plight of those campaigners and supporters of Buhari. He doesn’t believe dishing out fake news that can only be believed by imbeciles will turn black into white. Nigerians know that Chief Obasanjo has only spoken the truth about widening poverty, alienation and social disunity and near disintegration of the country through Buhari’s incompetence. Obasanjo will continue to exercise his right to free speech and no amount of hate speech will assuage Nigerians who are in need of a brand new leadership. The mediocre performance of Buhari cannot be described by anybody as ‘superlative’ even by morons not the least President Obasanjo. 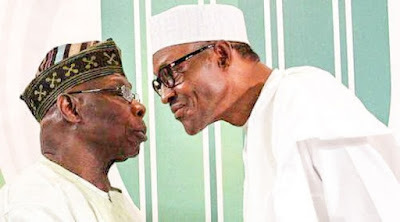 From the Buhari/Trump meeting, Chief Obasanjo only saw through three points: One, the US will continue to reduce purchase of crude oil from Nigeria and there is nothing Nigeria under Buhari can do about; two, the US will export agricultural products to Nigeria and Buhari’s government will encourage that; and three – all the killings taking place in Nigeria by herdsmen are being done by expatriates trained by Gadaffi and no Nigerian is to blame and Buhari cannot do anything to stop it. For whatever the meeting was worth, President Buhari again bungled another opportunity to self-redeem. No wonder President Trump ordered him in a rather condescending manner to go back home and stop the killings going on in Nigeria! We hope now Buhari will heed Trump’s advice which hopefully will be considered non-abusive. Therefore, Chief Obasanjo is more convinced in his statement of January 23rd and will not change his position. No lies, fake news dished out by these desperate and unintelligent supporters is worth believing and these misinformation cartel and social media tigers will do more damage to the flint reputation of their principal. Chief Obasanjo understands that the internet has good and bad uses. Those abusing the media should desist from this barbaric act as it will only expose them to greater ridicule at the end of the day. Obasanjo will continue to speak out. He will continue to issue patriotic statements under his signature or cause them to be issued on his behalf under the signature of his media representative, Mr. Kehinde Adeyemi.